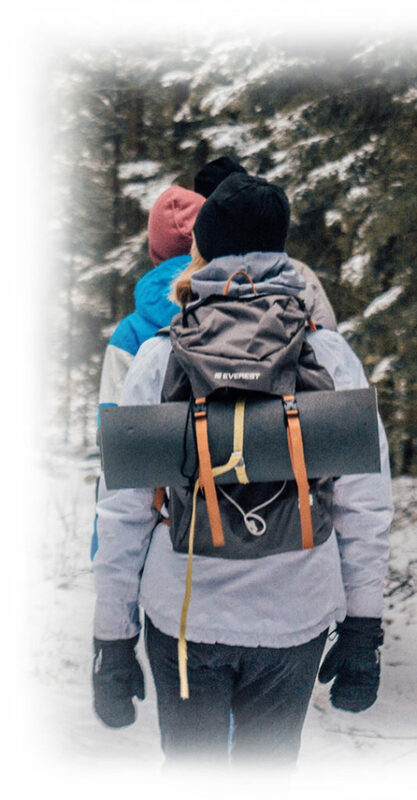 Blackbook Traveler – Adventurous. Informed. Empowered. In 2008, Britt Lapthorne, an Australian traveler, was kidnapped and murdered in Croatia by criminals targeting travelers in a local nightclub. Her killers have never been caught. Sadly, this was not the first traveler targeted at the same venue and in the same way. This important information only came to light after Brit disappeared. Britt – and her family – had no idea. Through technology, we now have the means to potentially avert a similar incident – by empowering, informing and connecting global travelers and their families. In 2013 we launched our world first online ‘traveler to traveler’ warning system, allowing travelers to post safety, security and health issues abroad and receive alerts from other travelers. In this same year, we commenced the Missing Pages Program. Missing Pages helps families of missing travelers, through the creation and funding of location targeted social media campaigns, instantly reaching 100,000s of people. We have learnt much over the last 10 years and are very excited in 2018 to be launching our Global Travel Safety App ‘OkAway’ and expanding the Missing Pages Program. After completing her Business Degree in Tourism, Veronica explored her passion for travel, solo backpacking around the world. During this time she had some amazing experiences, met some inspirational people and also had some close calls of her own. On her return to Australia she pursued a career in Marketing Communications and Event Management spanning Corporate, Government and Not-for profit sectors. The plight of Brit Lapthorne in 2008, struck a chord. 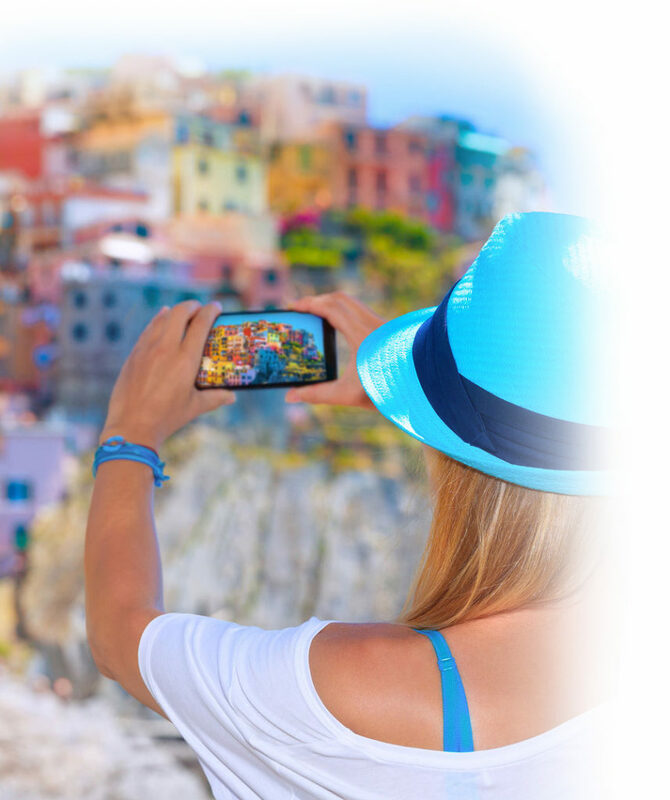 Blackbook Traveler is proud to announce the upcoming launch of our ‘OkAway’ travel safety App. Building on 10 years of research and experience in travel safety, our goal is to build the world’s leading solution for safer travel. 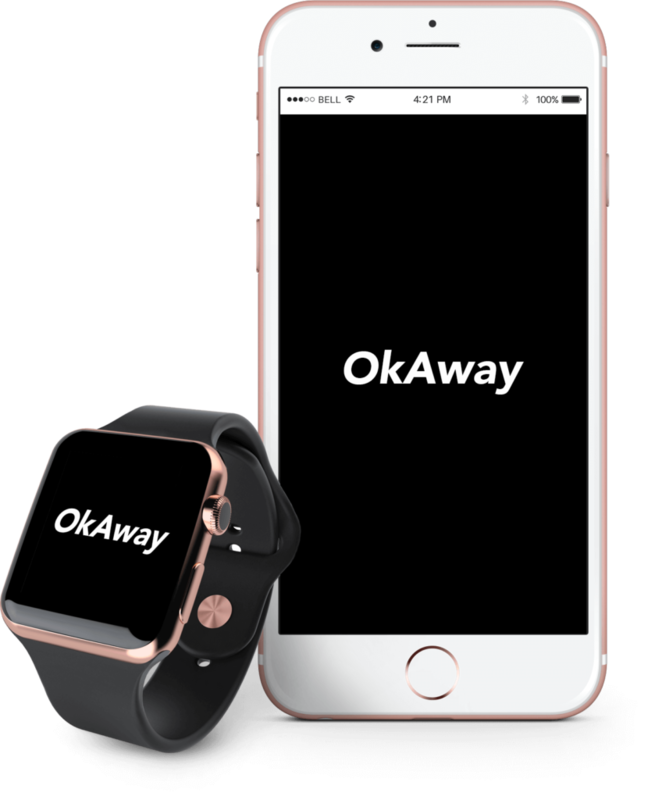 OkAway will be an essential app for the travelling community. Each year thousand of tourists go missing while abroad. Time is crucial when any person goes missing. However, the situation is further complicated for families when a relative goes missing in a distant country. Apart from the obvious distance, families may be faced with issues such as language barriers, customs, laws, bureaucracy, lack of resources or even natural disasters and war. And most governments are limited in what support they can and will provide. Missing Pages provides a valuable resource for the families of missing travelers, with our online campaigns instantly reaching 100,000s of people in the area a person has gone missing abroad. Campaigns are created in the local language, with leads passed onto family or relevant authorities. Since 2013 we have conducted over 25 International campaigns for missing travelers and their families. These campaigns have involved liaison with Embassies, Police, Media and Search and Rescue, as well as encouraging Missing Person Poster distribution with locals. Each campaign is unique with some requiring additional media, direct email, research, ground support assistance and in one instance a ‘Go Fund’ me page for a recovery/repatriation mission. Below is a snapshot of our campaigns for missing travelers. Please click on a selected campaign to read about our work. 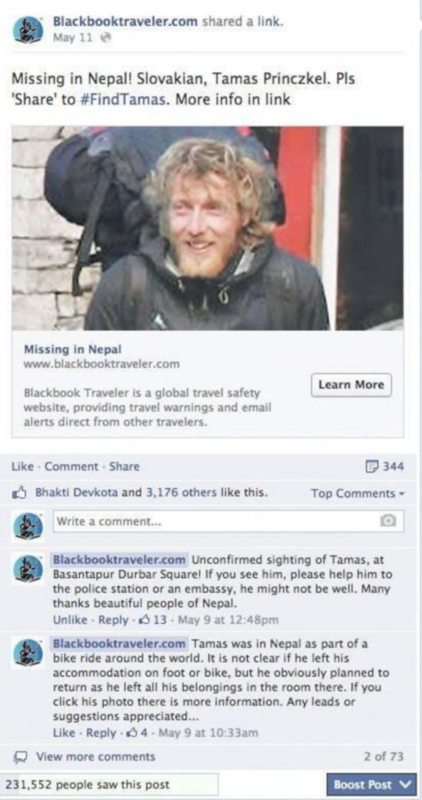 Blackbook Traveler has run a number of online Campaigns in Nepal for travelers missing in the region. 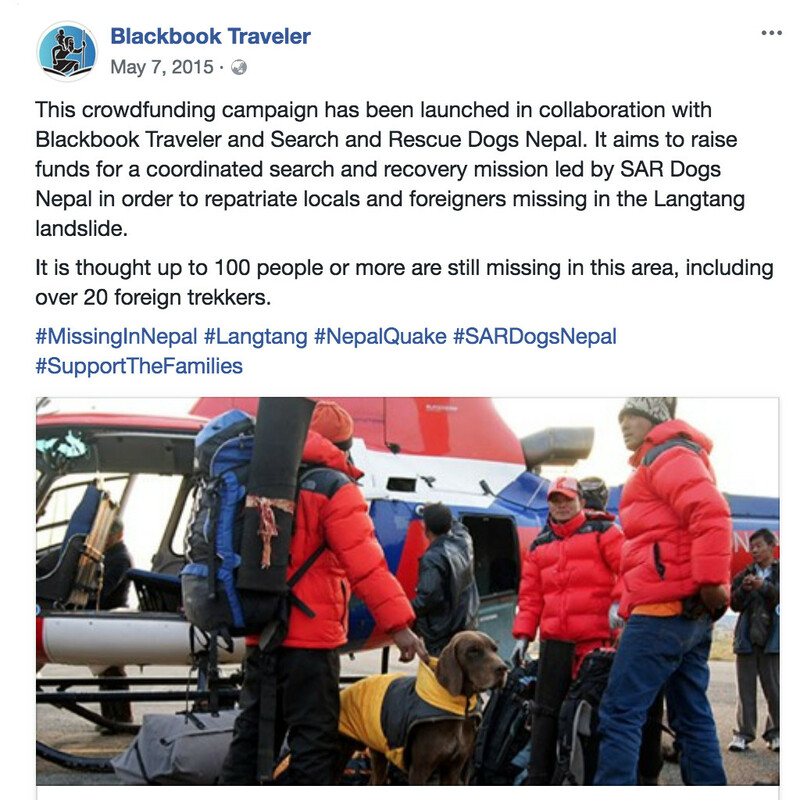 During the 2015 Nepal Earthquake, Blackbook Traveler also assisted us with processing Missing Traveler details and plotting last known co-ordinates for over 80 travelers reported missing, as we attempted a final recovery mission. Blackbook Traveler helped me find peace whilst in search for my brother who was missing in Paris. The social media campaign they ran through Missing Pages helped us raise awareness by going viral and reaching a vast number of people in the location he was last seen. Their attentiveness and continuous support gave me the reassurance to push through a very difficult ordeal. Blackbook Traveler approached us when my son Owen Rooney had been missing in Canada for 3 years. They helped us with a web and Facebook awareness Campaign for Owen as a missing person. The campaign targeted a broad number of specific places reaching far more people that we had been able to. We followed up on leads that were sent in by the public as a direct response to the campaign. 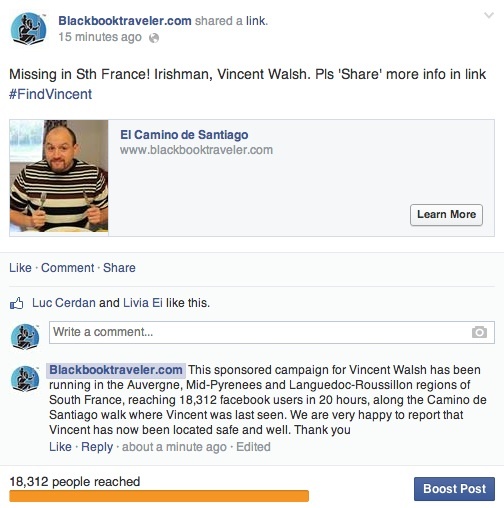 Blackbook Traveler is currently seeking global partners and additional funding to expand the Missing Pages Program. If you would like to know more about the unique value our app and programs will offer the travel community and your organizations, please message us via our contact form. 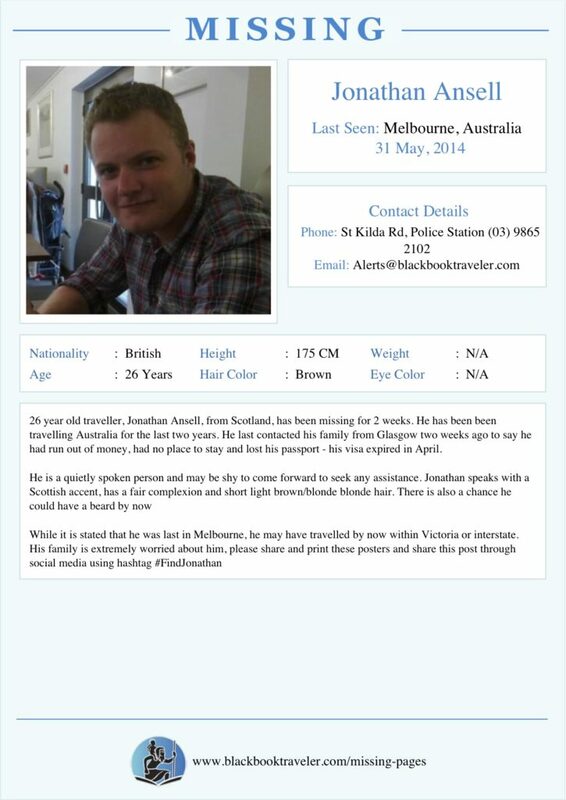 We commenced a sponsored Facebook campaign for Jonathan targeting the Melbourne area. 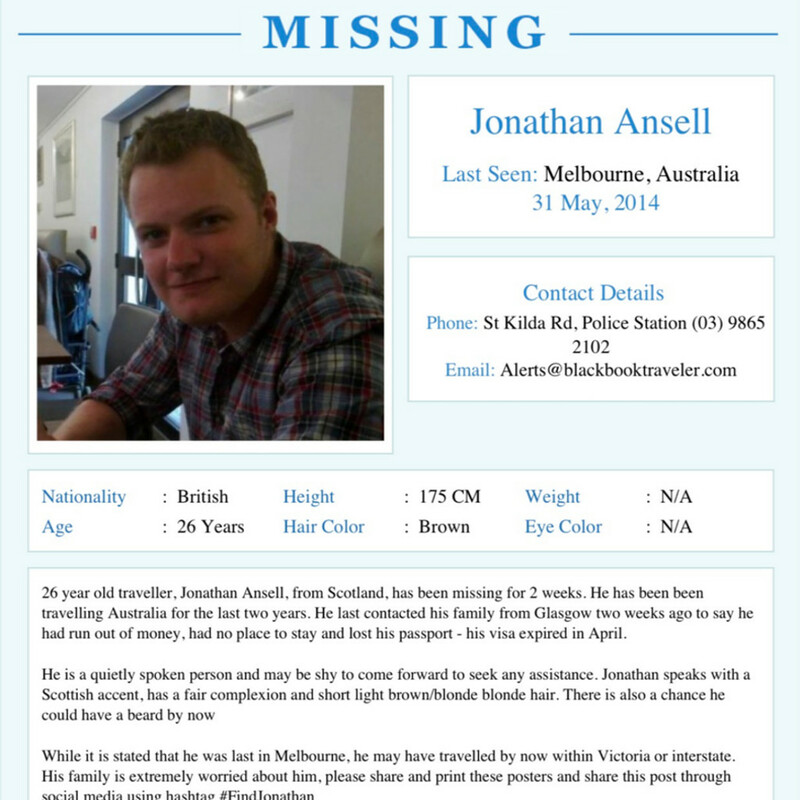 For this campaign, we also shared the Blackbook Traveler Missing Person’s Poster of Jonathan in the comments section of the Facebook post and encouraged locals to print and distribute. The campaign was successful, reaching over 20,000 people in Melbourne in 30 hours. Nearly half this reach was viral/organic, with 85 shares and 33 ‘likes’. We also shared the campaign on Twitter where it received a total of 18 re-tweets using the hash-tag #FindJonathan. There was some talk that he may have gone to a festival in Port Arlington, so we emailed the poster to camping grounds and accommodation in this region too. Thankfully 30 hours into the campaign Jonathan was located safe at Southern Cross Railway Station, where he had been living it rough. He was reunited safely with his family. We received one message to the Blackbook Traveler email with a reported sighting on a tram, but this came after Jonathan had been located. On 25 April 2015, a devastating 7.8 magnitude earthquake struck Nepal. Over 8,000 people were killed, 17,000 reported injured and 2.8 million displaced. The popular tourist region of Langtang was hit hard, with landslides wiping out entire villages and trekking routes. Around 300 people were killed here including 120 foreigners. 12 days later, the Government ordered all International Search and Rescue (SAR) teams to leave Nepal. This left many foreigners unaccounted for, especially in the Langtang region. Many families took to chartering scarce and expensive private helicopters, employing local trekking guides or turning to groups such as SAR Dogs Nepal to continue the search. SAR dogs Nepal are not for profit and receive no government funding. 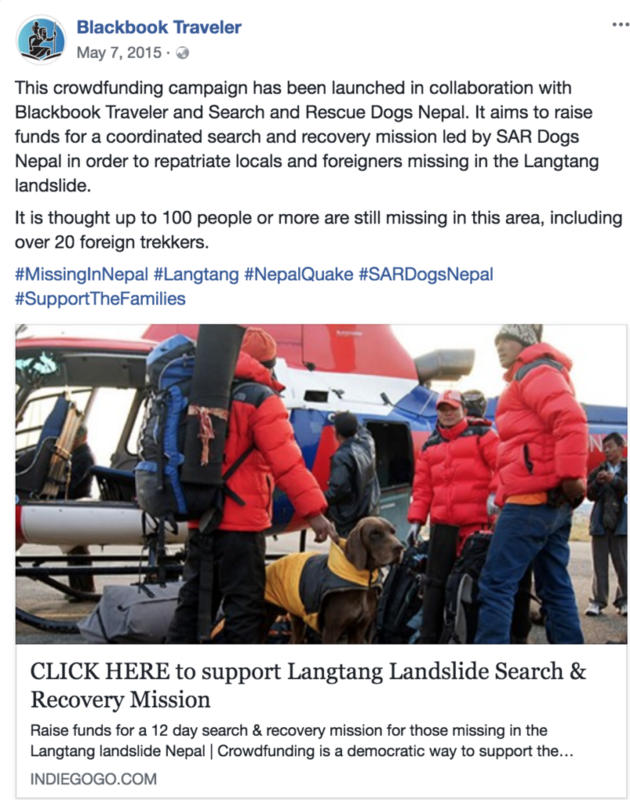 Thanks to a relationship built up by Blackbook Traveler from previous campaigns; SAR Dogs requested all details be logged through our Missing Pages Program. Given the time passed and local conditions, this was a recovery, not a rescue effort. bringing families and their knowledge together to allow the search to better target the impacted areas – and maintaining maps, communication and registers via the SAR Dogs website. using our fundraising experience through 20 previous campaigns, to help raise US$18,000 for the searchers – and to get it to them fast and direct. coordinating embassies and missions in Country to focus recovery funds via SAR Dogs networks. reaching over 880,000 people via Social Media Campaigns. leveraging awareness to secure a 4WD and helicopter for the recovery effort and ongoing SAR Missions. Speed is everything in these campaigns where bureaucracy and administration cost lives. Blackbook stayed in support of SAR Dogs until further earthquakes and conditions concluded the search. Vincent’s last contact came early into the famous El Camino de Santiago pilgrimage walk along the French / Spanish border. For this campaign, we specifically targeted Facebook users in the towns along this walk plus a 15km radius of these towns. This included towns in the regions of Auvergne, Mid-Pyrenees, and Languedoc-Roussillon. 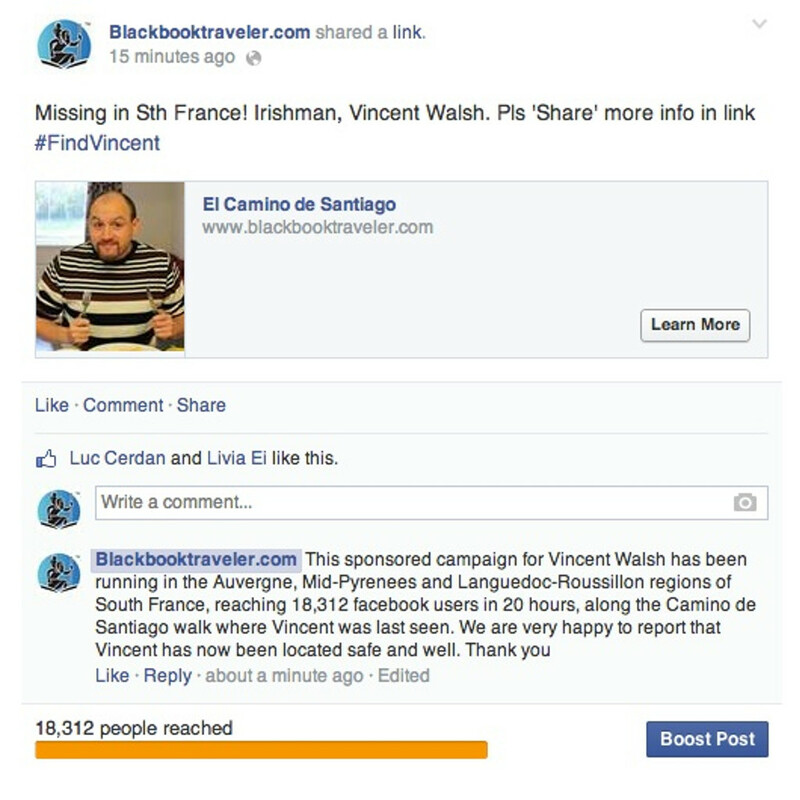 We also sent out a Blackbook Traveler Missing Person’s Poster in French. Both the poster and campaign were tweeted using the hash-tag #FindVincent. The campaign wasn’t organically successful but received a great paid reach of over 18,000 people in this region in only 18 hours. This campaign was cut short when thankfully Vincent’s whereabouts were confirmed with a sighting of him leaving a backpackers hostel. 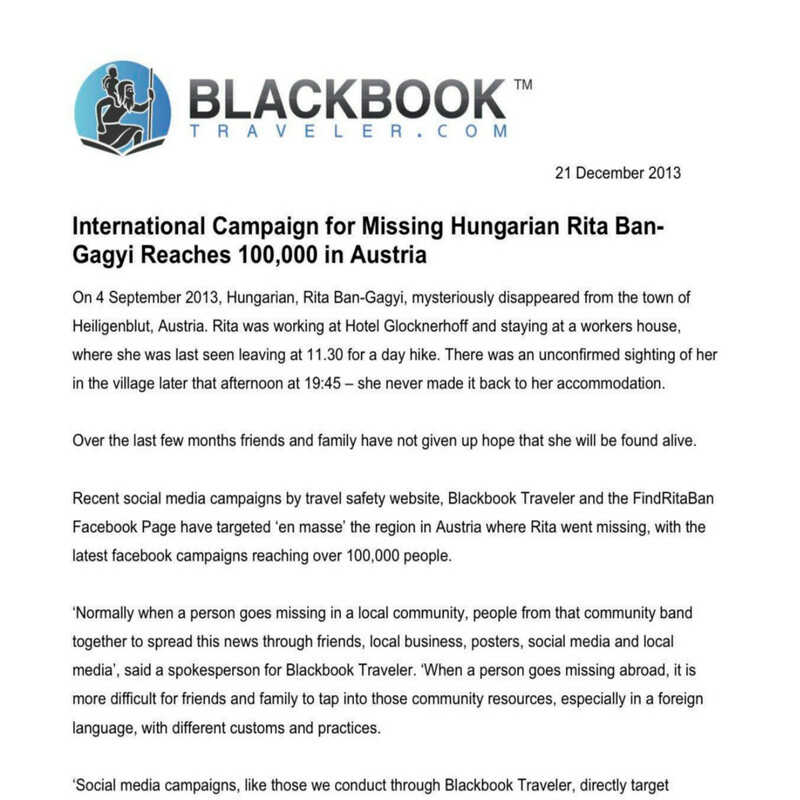 Blackbook Traveler conducted a targeted social media campaign for missing Hungarian traveler, Rita Ban-Gagyi, who disappeared in Austria. Our campaign, created in the German language, went out to Facebook users in the Austrian region where Rita disappeared, reaching 68,000 people over 4 days. 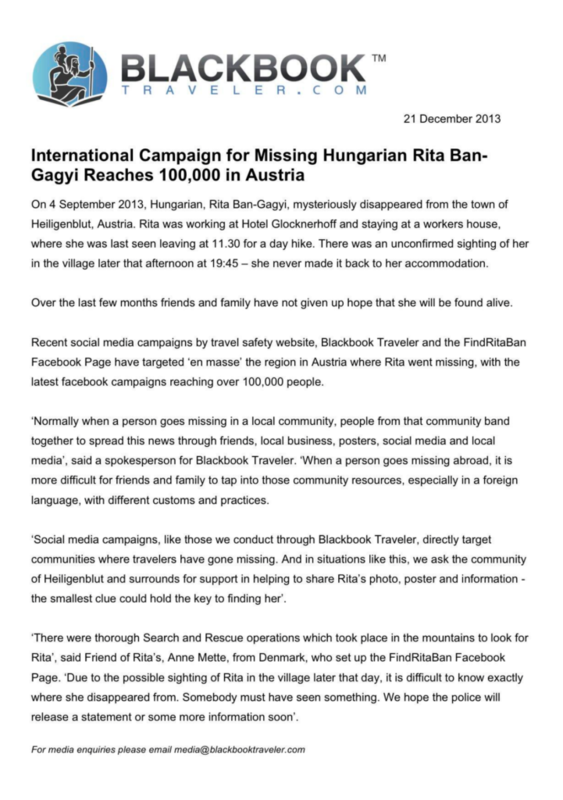 Blackbook Traveler also rolled out a media campaign in this instance, as Rita’s disappearance had not received much media coverage in Austria. Media releases went out in the German language, targeting t.v, print and radio across Austria. 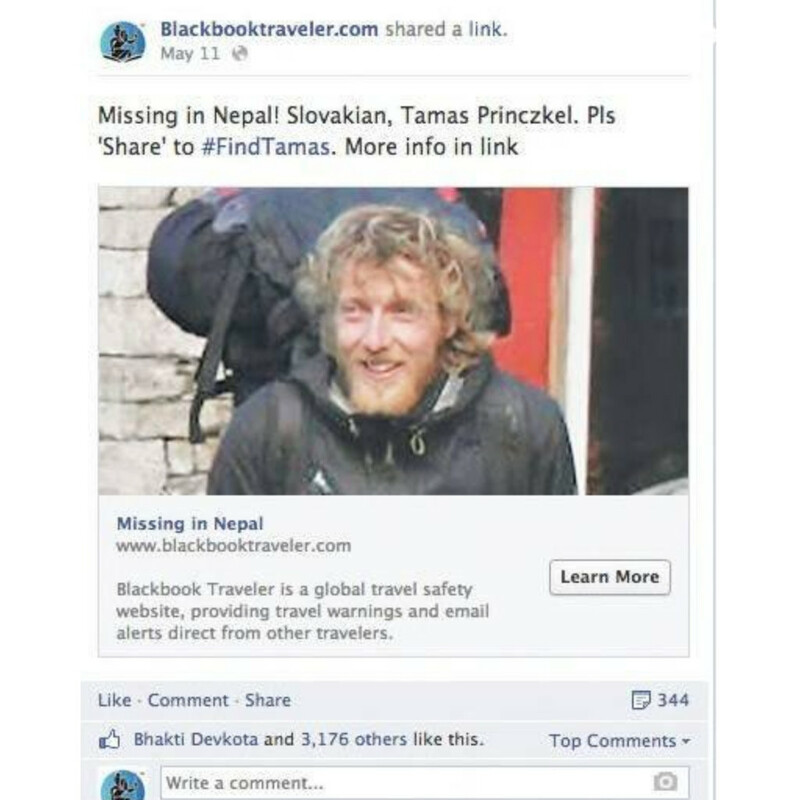 Blackbook Traveler commenced a 3 day targeted Facebook campaign for missing Tomas Princzkel in an effort to spread the word of his plight and perhaps generate some leads from the locals. The campaign, targeting people with interests in trekking and mountaineering, went viral reaching over 300,000 people in Nepal including 344 shares and over 3000 ‘likes’ and 125 comments with some good feedback from local Nepalese sherpas and guides. For this campaign we were in touch with the Embassy of the Slovak Republic in Delhi, the Honorary Consul of Slovak Republic in Nepal. We created the hash tag #FindTamas which was shared throughout twitter. Tomas is yet to be found.